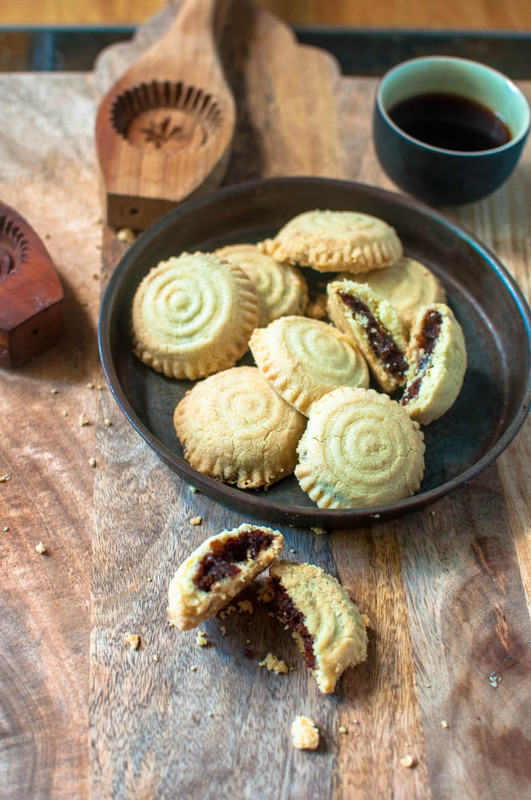 As Easter approaches, one great way for me to connect with my memories of growing up in Lebanon is to make our traditional Easter sweets, maamoul. 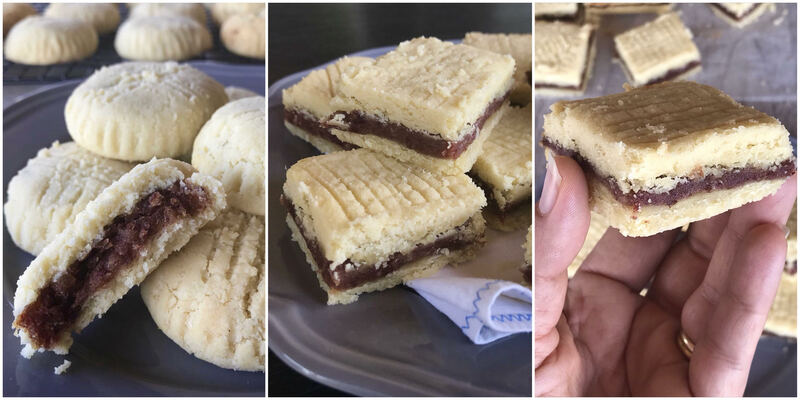 I remember being in the living room as a child, with my mum and four or five of her friends, making huge quantities of this delicious shortbread. This community of women would get together to collaborate on this mammoth project, entertain each other through hours of baking, and to supply their individual households with kilos and kilos of this highly sought-after delicacy. The ladies would have each prepared their pastry and fillings the night before at home. This is the easy part: the pastry is semolina kneaded with butter and scented with rosewater, and, sometimes orange blossom water. The fillings could be dates mixed with butter, or a variety of nuts – pistachios, almonds or walnuts – mixed with sugar and rosewater. The labour-intensive part is making the individual pastries. 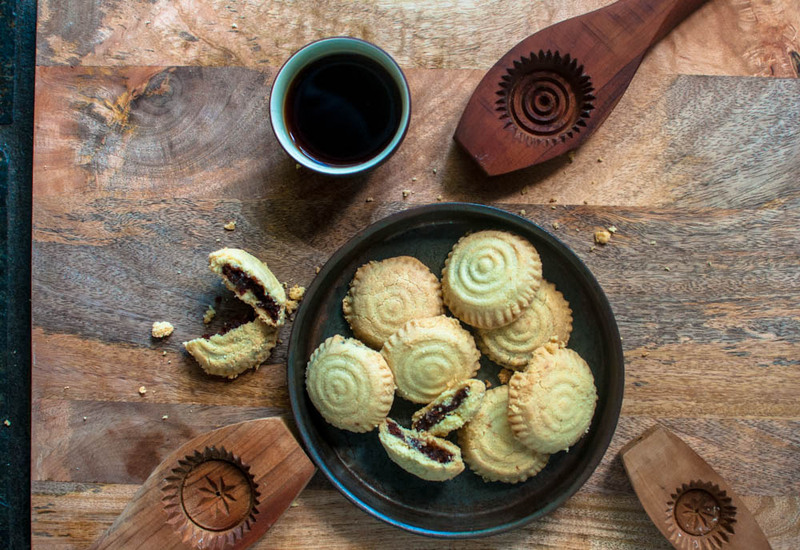 Though not particularly back breaking work, filling the pastry with dates or nuts, placing them in the specially designed maamoul moulds (different designs for different fillings) and then knocking the mould on a wooden board and filling up over a hundred trays requires patience and company. We had a round, flat portable oven that we used especially for these occasions and though the smell of freshly baked maamoul would be intoxicatingly beautiful and almost impossible to resist, we would have to wait until Easter day before we got a chance to try any. Lent is a period of contemplation and prayer, and sweet delights such as maamoul were not to be consumed. Can you imagine how much discipline and parental pressure it took for us kids to not steal some when the parents weren’t looking? I miss these communal gatherings I experienced as a child. The coming together of neighbours and friends to keep each other entertained and motivated is a beautiful thing to take part of, and life in Australia seems too busy for such an event to occur. And since I quit eating gluten, I also miss maamoul. This year, however, I took it upon myself to make the impossible possible. The challenge was, could I create a gluten-free maamoul that was as good as the real deal? 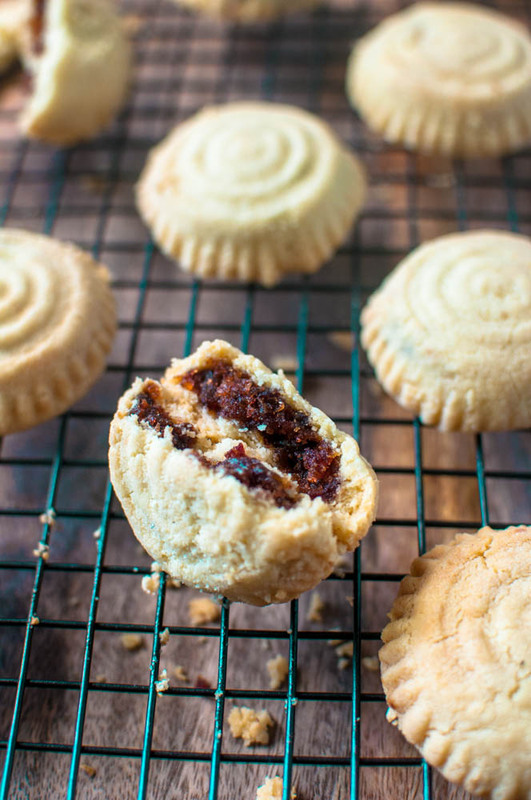 Inspired by my macadamia and currant shortbreads which I included in our cookbook, Life-Changing Food, I have created this recipe for gluten-free/grain-free maamoul. The result, I promise you, is as good if not better than the originals. And if you don’t believe me, bake a batch and see for yourself. The only thing is, do you have the self-control to wait until after Easter to dig in? Maamoul moulds can usually be found at most Middle-Eastern food shops. They can also be found online on websites such as e-bay. You can choose to use Asian pastry moulds too, if these are more readily available where you live, or you can shape the dough as per the recipe, then flatten slightly and decorate with a fork (see photos below). We have also provided a method for baking these as a slice, so if you can’t find the moulds, there’s no need to miss out! Place all ingredients into TM bowl and blend 15 sec/speed 6. Set aside while making filling. Place dates and butter into clean TM bowl and blend 10 sec/speed 7. Scrape down sides of bowl with spatula and blend again 10 sec/speed 4. Divide and roll dough into 24 balls of 25g each, dusting with tapioca starch so dough doesn’t stick to your hands. Divide and roll date paste into 24 balls of 15g each. Bake pastries for 30 minutes. They will still be pale in colour. Remove carefully to cooling racks after 10 mins. These can be served warm or cool, but they will hold together much better after being in the fridge for a day. Divide dough into two equal balls and chill in fridge for 30 mins. Leave the date paste to sit out at room temp so that it is soft enough to spread. Grease a 20x30cm or 25x25cm baking dish, and line with baking paper. Press one ball of dough into lined dish to form the base of the slice, patting with fingers to even out surface of dough. If the dough has softened over this time, return to fridge to chill for 10 mins before proceeding with filling. Roll out second ball of dough between two sheets of baking paper, to fit baking tray exactly. Remove top sheet of paper and turn dough over into the baking dish, pressing down gently onto the filling. Carefully remove paper from top of dough, then smooth dough with fingers as needed. With a very sharp knife, slice into squares, cutting the whole way through. (Cutting the slice before baking makes it easier to cut after it’s cooked.) If you like, decorate top of slice with a fork to make patterns. Place slice into oven and bake 40 mins, or until cooked through. Slice will be pale in colour. Dough: Mix in a food processor or by hand until smooth. Filling: Mix in a food processor until a smooth paste is formed. Store in an airtight container in fridge for up to a month, or freezer for up to 4 months. * Note: Tapioca starch is preferred to arrowroot starch in this recipe, as arrowroot gives a more delicate and crumbly result. Ahhh, awesome!! That is so cool! 🙂 Let us know what you think of them…we are sure you will love them! 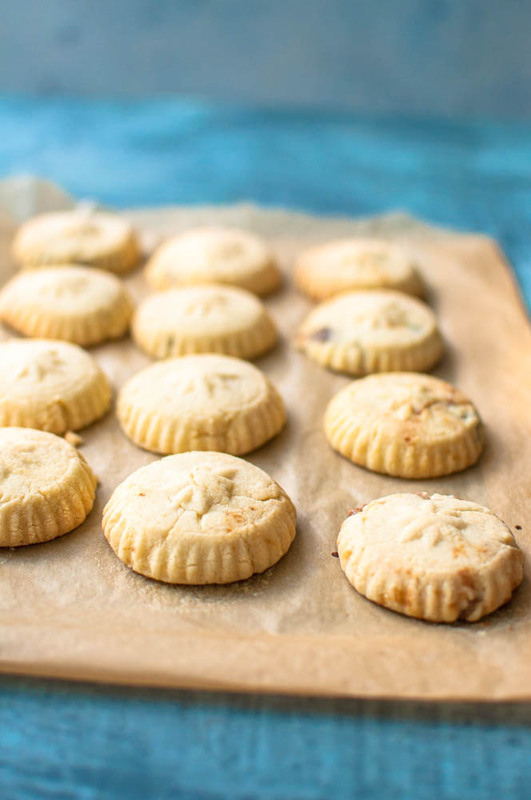 The Macadamia & Currant Shortbread is awesome, so I can’t wait to try this recipe. I’ll be doing it as a slice I think. Can’t wait to try this, thank you for sharing this recipe. My son would love this specially when he finds the filling. Awesome job sir, please do continue to share delicious recipes. Just went out and bought a mould … will have a go at making them for Easter. They look amazing! From a Middle Eastern grocery store. I’m in Melbourne inner north, so there’s quite a few around here. thats pretty straight forward for something so fancy and glutne free! 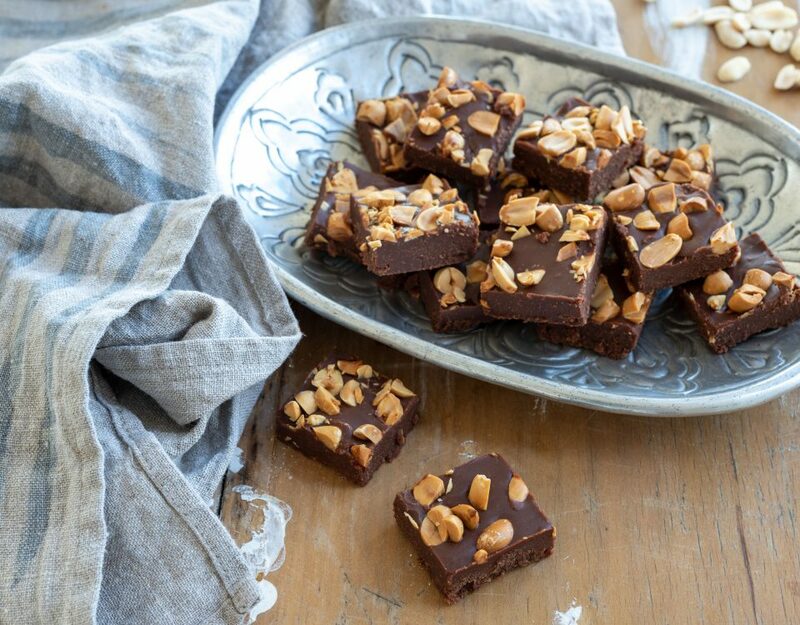 Hi, These look delightful, but as I am also dairy free can I use Nuttelex instead of butter. 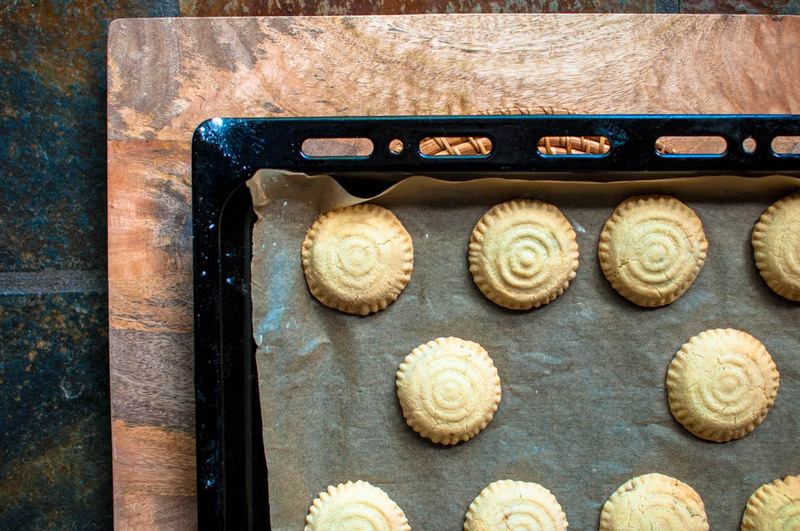 Can coconut oil or coconut yoghurt be used instead of butter to make a dairy free version of Gluten-Free Maamoul – Lebanese Easter Pastries? Please give advice for a dairy free version. Hi Lisa! 🙂 Coconut oil should work but we have not yet tested them ourselves. You may find the dough very soft to work with as we recommend using cold butter so perhaps try using cold (set) coconut oil or place the dough into the fridge for a while after making it, before shaping into pastries. Thank you for sharing, these sound delicious and so simple! You’re welcome Hanim! 🙂 These are simple and delicious – let us know if you give them a go! Hi Jo! What is rosewater? where do you buy it? HI Guys, do you think this would work without the filling? Can I use gluten free all purpose flour instead? If so, how much do I need? These look delish! 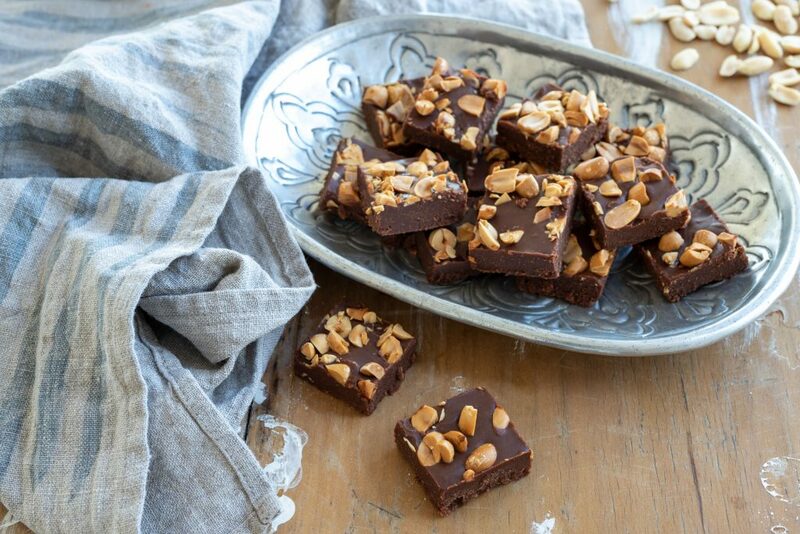 Can’t wait until we can have butter and nuts again, and these will certainly be on the list! I was so happy to find your recipe last week and couldn’t wait to try them. I did today but replaced the butter with cold ghee butter since casein doesn’t sit well with me and my son. I also added extra 50 grams each of almond flour and tapioca since the dough was extremely sticky and I refrigerated it before working with it. I substituted one of the tbsp rose water with orange blossom. The taste is amazing and I’ve been missing it so much but… I felt that maybe it’s too much tapioca. Could the ghee have changed the texture? Have you experimented with more almond flour than tapioca? Hi Sonia, thanks for your message! 🙂 Glad you found the flavour amazing! We extensively tested this recipe. Did you use tapioca flour or arrowroot (quite often these are used interchangeably) as we found using arrowroot really effected the end result (more soft and crumbly). We also found chilling the Maamoul was preferable in texture to eating them warm. You are right, they are better enjoyed chilled. Yes I have followed your advise about using tapioca. I must confess that I’ve made them 3 times already (they don’t last 😉) but have now exchanged the amounts to 350g almond flour and 150 tapioca.. This works great for us. I also made the walnut/honey stuffed Maaloul. Delicious!!! Thank you so much for this recipe. What is a TM bowl? Hi, I made these last Easter and they were wonderful. My husband has requested them for his birthday…and I was wondering whether anyone has tried a pistachio filling instead (just to try another traditional version)? Wondering how much pistachio/sugar/orange blossom to mix up to fill this much pastry?